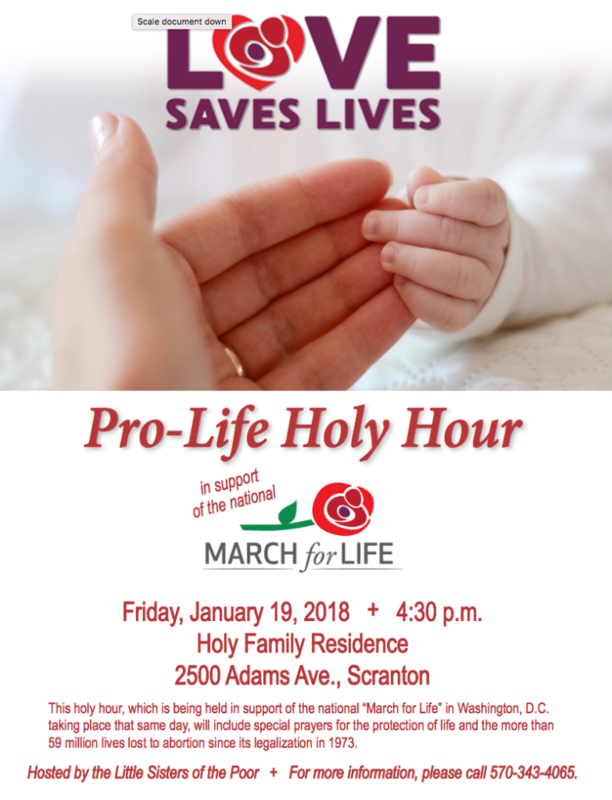 The Little Sisters of the Poor will host a special pro-life holy hour at 4:30 p.m. Friday, Jan. 19, in the chapel of Holy Family Residence, 2500 Adams Ave., Scranton. The holy hour, which is being held in support of the national “March for Life” in Washington, D.C. taking place that same day, will include special prayers for the protection of life and the more than 59 million lives lost to abortion since its legalization in 1973. The Little Sisters of the Poor, who have been serving the elderly of Northeastern Pennsylvania since 1908, work closely with staff, volunteers, and benefactors to create a family spirit for the residents who make their home with them. They welcome the elderly who have limited funds and provide for their needs so they can thrive in an atmosphere of respect, dignity, and love.